It's finally November, which means I can finally get going on my holiday crafting. Yay! Today, I've got an easy and inexpensive tutorial for decoupaged holiday candles using Martha Stewart Crafts Decoupage. I think these are so pretty and I love how simple they were to make! Take one napkin and measure it against the first candle. Trim the napkin to size. Separate the two layers of the napkin and keep the printed piece. Paint Martha Stewart Crafts Decoupage Glitter on the surface of the candle. Place the trimmed napkin around the candle, on top of the decoupage glitter. 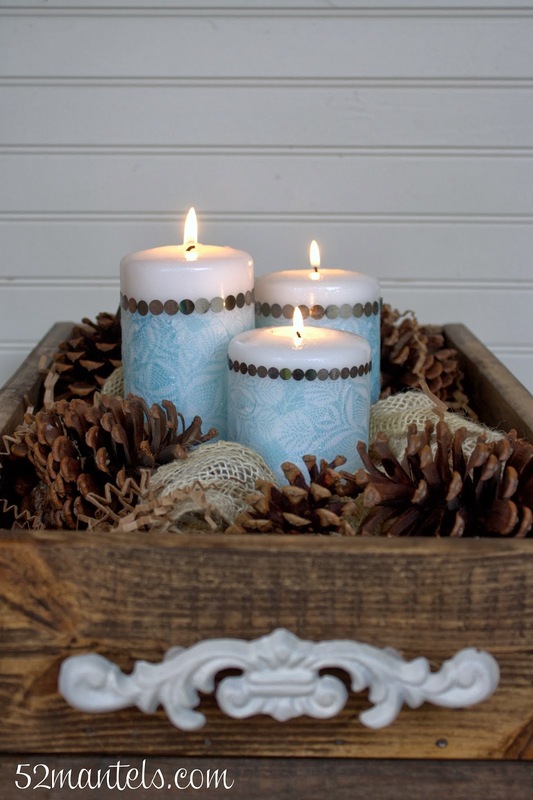 Paint decoupage glitter over the entire surface of the candle, covering the napkin completely. Measure and cut the metallic trim. Use the decoupage glitter to attach it to the candle. Repeat process with remaining candles. Let each candle dry completely, before using. That's it...so easy! 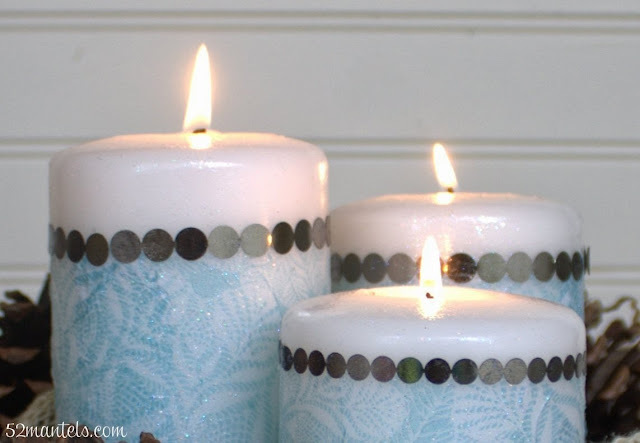 And, the glitter finish adds such a nice sparkly touch that really shows up when the candles are lit! 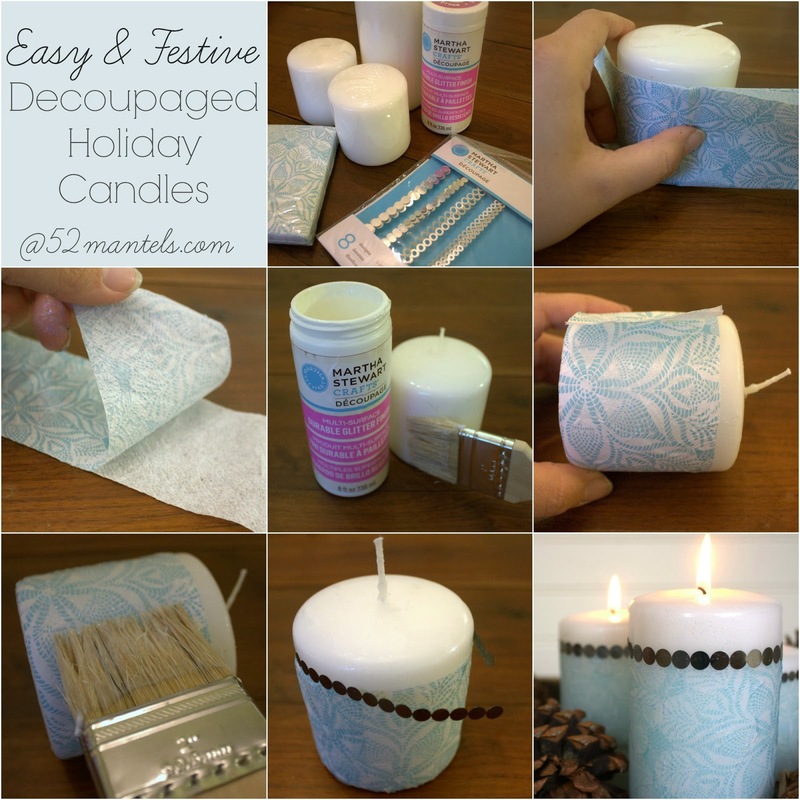 This decoupage medium is so cool for several reasons. One, it's versatile and dries quickly, without yellowing. Two, it's so SIMPLE to use. Three, it's super durable and can be used for in indoor AND outdoor spaces. (Incidentally, this decoupage medium is also dishwasher safe. But, don't put your candles in the dishwasher. That would be silly). You can get these supplies and more at Michaels or on Plaid's online store. 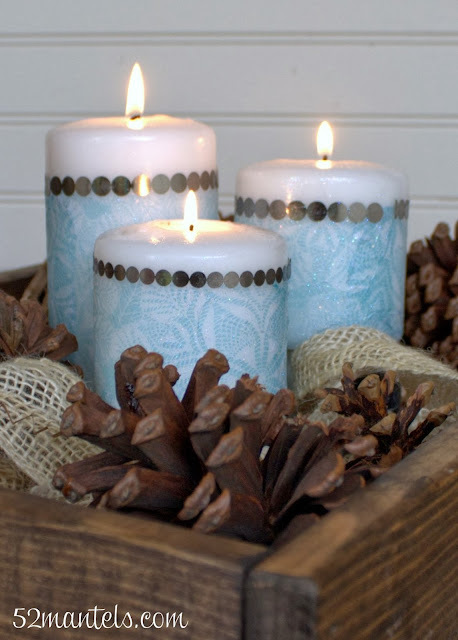 I chose wintry, Holiday napkins for this project, but this can be tailored for any occasion, season or holiday! For more inspiration, visit Martha Stewart Crafts on Facebook, Pinterest or sign-up for their newsletter. And, check out the fun tutorials below! **I received compensation for this post, but all opinions are 100% mine. Thank you, Tanya! I love those strips too. Such a fun craft supply! Emily, these are precious! 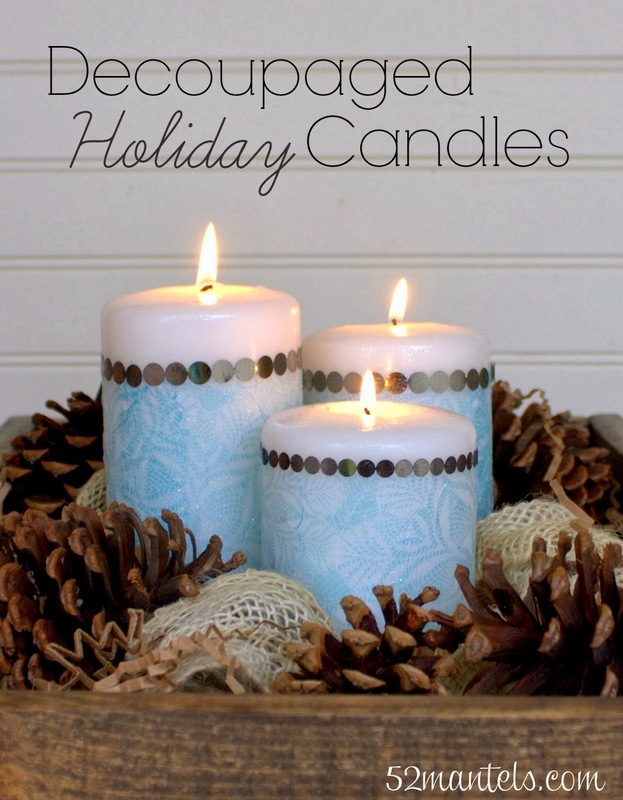 I have not tried the decoupage yet, but I so need to! Thanks for sharing! Emily these are great and perfect for any time of year!